Not having an Arduino board: ok, but I'm interested to know why you wouldn't want one ? Do you have any specific complaints against it? The main reason is: I have too many toys at the moment (GSM modules, Beagleboard-xm, RFID reader, touch screens, ...) and an additional toy would reduce my sleep to a horrible minimum! Another reason is that it would be too much hardware for my use-case. The solution should be as simple and cheap as possible. Nice work! Because I have a NFC module based on the same chip (PN 532) in combination with a I2C -> RS232 module I'm really interested in the Java lib you wrote to access the NFC module. Question: Is the code available somewhere on the web or would it be possible to get it fro you? Hi Gerrit, the code is licensed under Apache 2.0, but I need some time to move the code to a public repository. I'll let you know if its available. 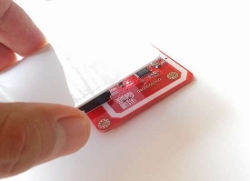 Could you post dimensions (width and length) of this NFC board? I can't seem to find them anywhere. Hi rjahn, very interesting subjet. I'm trying to use your library but I'm having some issues. I use your libary but I have problems about reading the tag because I use Mifare Ultralight tags and no Mifare Classic tags. Dos anybody have some hints for me what I have to change? I've no experience with such tags. Did writing work? The library is not complete because it was designed for one use-case. There are complete NFC libs available! No - the libary found the card but doen't get the ACK frame. I know that there are libs - but I use a beaglebone and want to use java and other libs are really big and complex, or do you have a recommendable other lib? Yes, the lib is small and the complexity of all other solutions was the reason for developing a small one. But I didn't own different tags, so classic was my first choice. It took about 1 day to implement current eNFC functionality (without refactoring), so it shouldn't be more than some hours to change it to support ultralight. Thank you very much for your fast replys! One question - have you already tried to emulate an ISO14443-3? I want to extend your java lib - but I'm not able to init the PN532 as a Target. We didn't try ISO14443-3. The library was a short research project and not designed as universal solution. Do you have example (C/C++) code for PN532. I could help with some input if possible. The implementation with spec only is not a problem but needs more time! I know that this lib isn't a universal solution, but it's a good basis, because it's not so large. I want to set the PN532 to the TgInitAsTarget mode, so that I'm able to emulate an tag and also to do p2p communciation. But first I'd like to emulate a card, what a Android smartphone could read. But I'm not so well skilled in C.
I would be very very grateful, if you could give me some input. Nice implementation. It shouldn't be too hard for you, to implement this with Java.